Communication in a mass casualty disaster scene is limited and difﬁcult for medical personnel in the absence of necessary communication infrastructure and collaboration technologies. It leads to misdirected and delayed triage of scene-wide critically injured patients, especially when there is a large volume of patients needing diverse care levels. Panacea’s Cloud provides an effective communication and coordination tool in disaster situations. This system utilizes an Intelligent Dashboard, video feeds, and the integration of Internet of Things in order to provide optimum support for the duration of the emergency. Our work lays the foundation for next-generation ICS for an Incident Commander to deploy resources at the right locations more efficiently, and reduce triage time, mitigate over/under triage, and thus increase triage care levels. 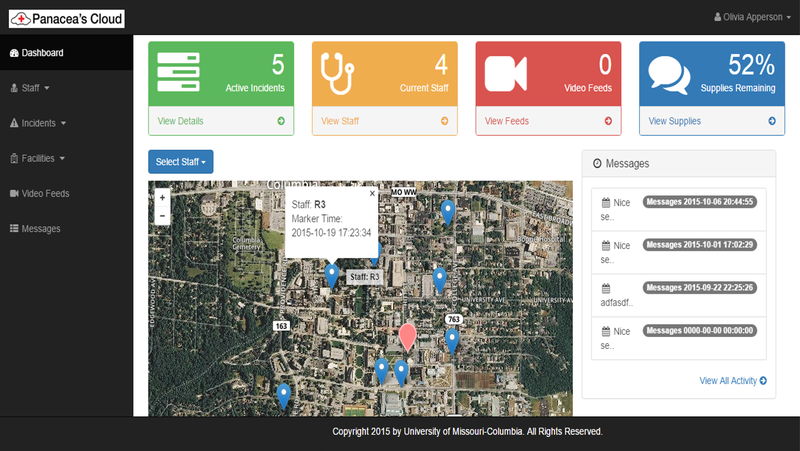 Panacea’s Cloud provides a variety of features that effectively aid first responders and Incident Commanders in communicating during a disaster situation. The Responder Theater Dashboard allows the Incident Commander to efficiently instruct and direct first responders in an emergency situation. Through the use of Heads Up Displays (ex. Google Glass and Recon Jet) Panacea’s Cloud provides the ability to share audio and video feeds between first responders and Incident Commanders. This communication allows for real-time instruction and gives the Incident Commander mass amounts of information that can aid in making more informed decisions. Panacea’s Glass utilizes Virtual Beacons in order to document both the location and statuses of patients in an emergency situation. Through the use of low energy Bluetooth, these Virtual Beacons are able communicate with our system and place patients on a map for the Incident Commander to see. Panacea’s Cloud is composed of a mesh network that runs independently of WiFi and other outside networks. This fault-tolerant network and mobile cloud allow for deployment anywhere and eliminate failures that take down the whole system. Panacea’s Cloud is entirely contained within a single enclosure. This conveniently small, rugged, and waterproof enclosure makes it optimal for transportation and usability in all environments. F. Demir, S. Ahmad, P. Calyam, D. Jiang, R. Huang, I. Jahnke, “A Next-Generation Augmented Reality Platform for Mass Casualty Incidents”, Journal of Usability Studies, 2017. P. Calyam, D. Chemodanov, R. Gargees, B. Morago, R. Pelapur, Z. Oraibi, Y. Duan, G. Seetharaman, K. Palaniappan, “Incident-Supporting Visual Cloud Computing Utilizing Software-Defined Networking, IEEE Transactions on Circuits and Systems for Video Technology (SI on Visual Computing in the Cloud: Mobile Computing), 2016. E. Cheng, K. Meiss, K. Park, J. Gillis, D. Weber, S. Ahmad, P. Calyam, “Contextual Geotracking Service of Incident Markers in Disaster Search-and-Rescue Operations”, IEEE Symposium on Network Computing and Applications (NCA), 2016. J. Gillis, P. Calyam, A. Bartels, M. Popescu, S. Barnes, J. Doty, D. Higbee, S. Ahmad, “Panacea’s Glass: Mobile Cloud Framework for Communication in Mass Casualty Disaster Triage”, IEEE Mobile Cloud, 2015. M. Vassell, O. Apperson, P. Calyam, J. Gillis, S. Ahmad, “Intelligent Dashboard for Augmented Reality based Incident Command Response Co-ordination”, IEEE Consumer Communications & Networking Conference (CCNC), 2016.